The MACH-ProCom™ controller has won a 2008 BOM magazine Readers' Choice Award which recognizes the most popular products and suppliers from the past year. Winning products represent those which building owners and facility executives most often sought further information about after they appeared in the pages of BOM or on the FacilitiesNet website over the past year. An official BOM Readers' Choice glass award to prominently display in our office. 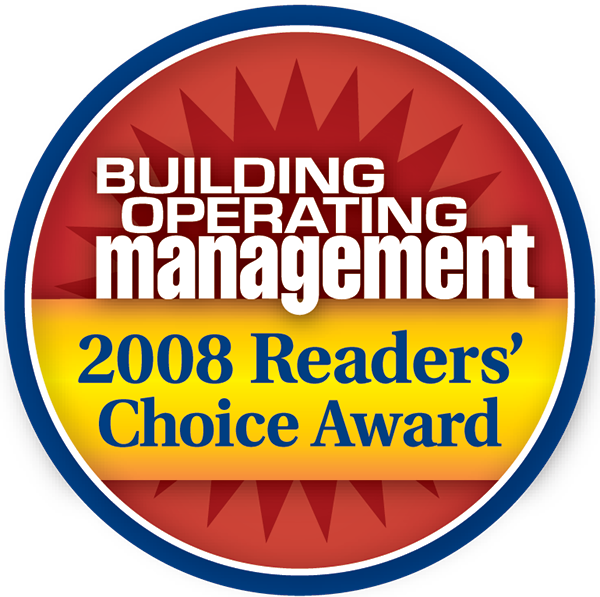 Look for the 2008 BOM Readers' Choice Award Special Report to be showcased in the January issue of BOM. Building Operating Management is the leading magazine for building owners and facility executives in commercial and institutional buildings. Readers are executives who own or manage high-rise office buildings, college campuses, school districts, hospitals, medical clinics, retail chains, hotels, and government buildings. Building Operating Management's editorial coverage explores timely topics such as: energy efficiency and strategies, facility technology, executive management, safety and security, facility management, and green buildings. Building Operating Management reaches a circulation of 73,000 and has been recognized as a Neal Award finalist for editorial excellence. For more information on the MACH-ProCom™ visit the MACH-ProCom homepage.